New trend you might not be aware of: Food-as-a-key-to-urban-revitalization. Sure, we all know how important food is to Portland’s popularity—we’re a terrifically foodie city—and restaurants contribute 27 percent of Maine’s $7.5 billion tourist industry (second only to retail, at 28 percent). But this new trend is about making sure that local food systems contribute to a healthy population by making fresh food available to all, regardless of income. In Portland, Mayor Michael Brennan started the Mayor’s Initiative for a Healthy and Sustainable Food System almost as soon as he entered office. The Initiative dealt with a wide range of food-system issues, from policy to how to set up a community garden on public land. It accomplished a lot—assessment of the gaps in Portland’s food policy environment, connecting more fresh food with the schools’ food service system, and particularly work in urban agriculture that has supported a new community garden on the Eastern Prom; The Mount Joy orchard of fruit trees on the North Street slope; and maybe, just maybe, a goat herd to clear out the brush around Portland’s parks. The great majority of this work was done by volunteers, coordinating with members of City government. It is not yet clear how the Initiative will take shape under the Strimling administration, but it is proceeding for the nonce as Shaping Portland’s Food System, again a volunteer effort coordinated with the City. Still not clear on how this is going to revitalize Portland’s marginal neighborhoods, Bayside chief among them? Well, a couple of local organizations have grant applications out to the Kresge Foundation and a partnership between the Robert Wood Johnson Foundation and the Reinvestment Fund. These funders are at the forefront of testing solutions for using food systems and health initiatives to improve the quality of life and opportunity in low-income neighborhoods. Stay tuned for word on whether either of these grants is coming to a neighborhood near you. The Robert Wood Johnson Foundation / Reinvestment Fund grants are based on the idea that we need to fundamentally change how we revitalize neighborhoods: in this case, “if you build it, it still doesn’t do a damn thing for well-being and opportunity.” In fact, they see that health-based programming goes far beyond local food systems and food production. The quality, stability, and availability of housing are also critical to revitalizing neighborhoods and improving well-being; so is education and workforce training; so is transit, so is reducing crime, so is improving local resilience against environmental crises (think West Bayside, East Bayside, and sea-level rise…). The Bayside Community Garden—Working on It! 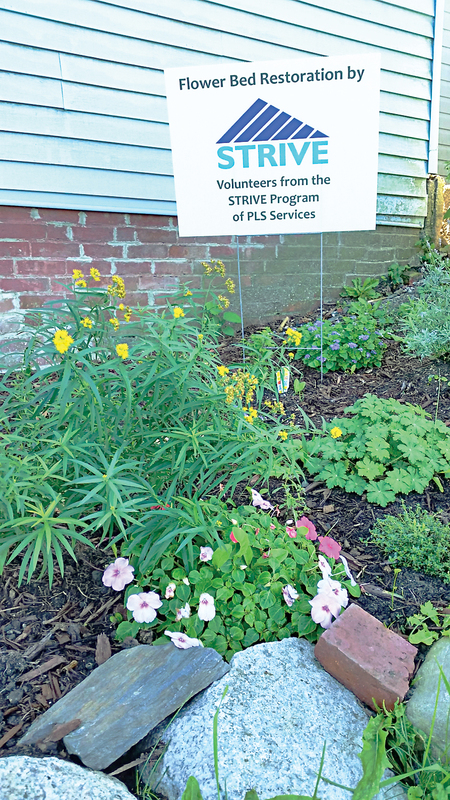 Last summer, with the help of a grant from the Harvard Pilgrim Health Care Foundation, the Bayside Community Garden started getting involved in some of these efforts and will continue to do so in the 2016 gardening season. As our gardeners know, we added two new beds for children from the summer lunch program, which we hope will catalyze more immigrant involvement in garden programs. We coordinated volunteers from the Bayside program of STRIVE, an agency that assists developmentally challenged young adults, and will be doing so again this year. We made an initial connection with the Locker Project, which gets excess produce onto the plates of school children. 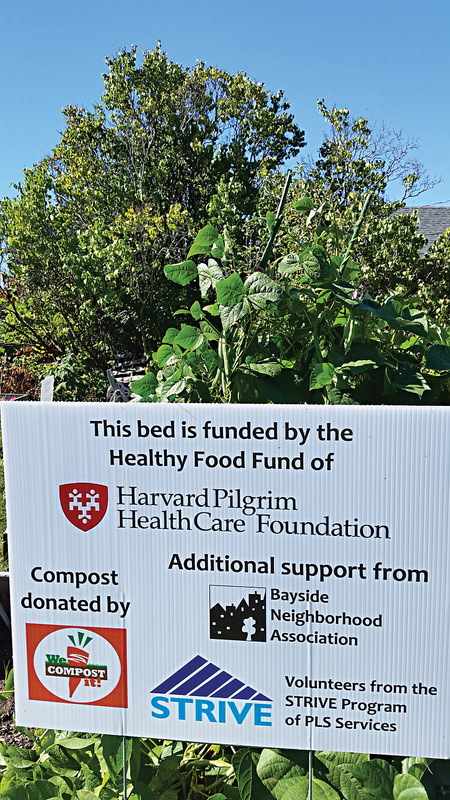 We were helped out not just by Harvard Pilgrim but the City’s department for Open Spaces, led by Troy Moon, and We Compost It!, Portland’s newest residential composting company. The Bayside Community Garden has a waiting list for plots, but it is much shorter than the waiting list for a City plot. Moreover, we have started looking into the new procedures for setting up a community garden on public land, with the hope of expanding food production in the neighborhood. We charge much less than the City for a plot—$20 to help replace tools, throw a Harvest Party, etc. The Bayside Community Garden will be identifying available plots starting in the last week of February. If you are interested in a plot, fill out the form on this page!